The hauling vehicle has a structural and handling weight limit determined by the original vehicle manufacturer. This distributed weight is placed on the hitch and thus on the vehicle itself. This tongue weight (TW) varies from a class 1 hitch of 200 lbs. to 1700 lbs. for a class 5 hitch. Just like pulling a trailer, hauling a load in the rear of the vehicle will affect the handling of the vehicle. Keeping the weight at or below the limit and having proper tires and proper inflation is very important. The distance of the center of gravity extended from the hitch receiver end should also be considered. Minimizing this distance will facilitate staying within the limits of the hitch and not adversely affect the handling of the vehicle. As the center of gravity is extended excessively rearward (aft), the front of the vehicle will experience a ‘lifting effect’ and reduce traction or steering ability of the vehicle. Hauling with a carrier, unlike towing on a trailer, is balancing and controlling a load on the rear of the vehicle. Keep in mind, the motorcycle is secured on the carrier in a position transverse or perpendicular to the orientation of the vehicle. In a sudden stop or acceleration, the cycle will tend to pitch toward the vehicle (for) and away from the vehicle (aft) respectively. This pitching force can be significant depending on the weight of the cycle and its center of gravity. The front wheel should be chocked against a stop and tied with rigid ties to the tray or placed in a cavity or pocket and secured with cam-lock style ties (no rubber or ‘bungee’ ties). Pulling the front forks to a fully compressed state is not necessary if the wheel is chocked properly. This consists of a vertical bar that is mounted to the carrier receiver tube and tied semi-rigidly to the cycle. 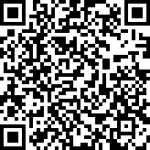 This is very effective in stabilizing the cycle and becomes critical in the event of an extreme maneuver i.e. sudden stop or harsh turn. Also, this allows moving the cycle in, closer to the vehicle, without the risk of the cycle hitting the vehicle. Vertical Stabilization is particularly important on road bikes or bikes with a high center of gravity. These cycles will be difficult to control by tie downs alone unless the tray is extended 6-18” further away from the vehicle to allow the sway or pitch to clear the back of the vehicle. NOTE: As the carrier is extended excessively rearward, strain on the suspension increases and vehicle handling performance deteriorates. Smaller cycles i.e. under 120 lbs can be pulled or leaned against the vehicle with padding and tied to the roof, roof rack, or tailgate for stabilization. 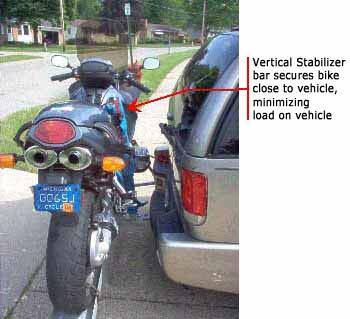 Vertical stabilization should be used to secure the bike, also but is less significant as the weight decreases. A spare tire that is rear mounted can be used to secure the bike and will also provide a cushion against pitching for smaller motorcycles. Vertically stabilizing the cycle also permits better ground clearance. In some cases the carrier outriggers (horizontal tie down bars) are up to 3’ long and reduce ground clearance of the carrier significantly. Always inspect the hitch before and at stops on trips. Inspect the hitch for proper bolt attachment and severe corrosion. The hitch is likely to be the weak link in the system. After loading and tying the cycle down, inspect again after a short trip for shifting and at least every 300 miles thereafter. Always be sure the state tag (license plate) is visible from the back of the vehicle to avoid safety citations. Use magnetic or permanently attached towing lights if the carrier and/or cycle blocks the tail lights on the vehicle.